In economics, there are two related models that have shaped standards of living and social classes today; these are Feudalism and Capitalism. In fact, renowned economists like Karl Marx would recognize some correlation between the two constitutions, such that in both structures, the power of the dominant class is based on the exploitation of the subordinate class. 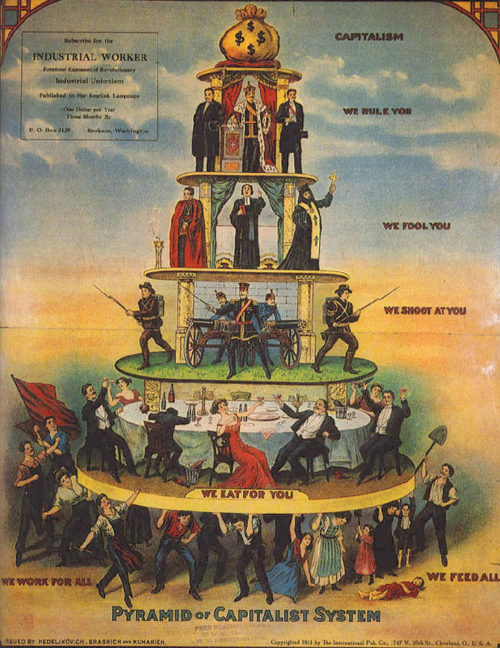 Despite the said similarity though, plenty of differences exist between Feudalism and Capitalism. Feudalism is a political and military system between a feudal aristocracy (a lord or liege) and his vassals. In its most classic sense, feudalism refers to the Medieval European political system composed of a set of reciprocal legal and military obligations among the warrior nobility, revolving around the three key concepts of lords, vassals, and fiefs; the group of feudalism can be seen in how these three elements fit together. The obligations and relations between lord, vassal, and fief form the basis of feudalism. A lord granted land (a fief) to his vassals. In exchange for the fief, the vassal would provide military service to the lord. The land-holding relationships of feudalism revolved on the fief. There were thus different ‘levels’ of lordship and vassalage. In a typical feudal society, the ownership of all land was vested in the king. Servicing him was a hierarchy of nobles, the most important of which held land directly from the king, and the lesser from them, down to the seigneur who held a single manor. The political economy of the system was local and agricultural, and at its base was the manorial system. In the manorial system, the peasants, laborers, or serfs held the land they worked from the seigneur, who granted them use of the land and his protection in return for personal services and dues. Throughout the medieval years, an increase in communication and the concentration of power in the hands of monarchs in France, Spain, and England broke down the structure and facilitated the emergence of the burgess class. The system broke down gradually and was eventually replaced by a more contemporary approach to resource management – Capitalism. Capitalism is one of the most influential factors that define economic classes today. It is a structure in which the means of production and distribution are privately owned and operated for profit. Capitalists are conventionally composed of private entities that make and implement market decisions regarding supply, demand, price, distribution, and investments without much intervention on the part of the public or government bodies. Profit, the major goal of any capitalist, is distributed to shareholders who invest in businesses. Salaries and wages, on the other hand, are paid to workers employed by such businesses. Capitalism, being an influential and flexible system of a mixed economy, drove the main means of industrialization throughout most of the world. There are different types of capitalism: anarcho-capitalism, corporate capitalism, crony capitalism, finance capitalism, laissez-faire capitalism, late capitalism, neo-capitalism, post-capitalism, state capitalism, state monopoly capitalism, and technocapitalism. However varying, there is general agreement that capitalism encourages economic growth while further extending disparities in income and wealth. Capitalists believe that increasing GDP (per capita), the main unit in measuring wealth, is set to bring about improved standards of living, including better availability of food, housing, clothing, and health care. They deem that a capitalist economy holds better practical potentials for raising the income of the working class through new professions or business ventures, as compared to other types of economies. Unlike feudalism though, capitalism doesn’t maintain lords and serfs. Rather, it recognizes corporations and businesses to be the ruling body over the working class. What makes it distinct from feudalism is that the subordinate class has freedom to demand from its employer and that the employer holds limited authority, mostly professional in nature, over the subordinate. 1) Feudalism involves aristocracy and vassals, while capitalism is privately owned and operated for profit. 2) The obligations and relations between lord, vassal, and fief form the basis of feudalism, while profit is the main goal of capitalism. 3) Capitalism doesn’t maintain lords and serfs. 4) In capitalism, the subordinate class has the freedom to demand from the employer. Celine. "Difference Between Capitalism and Feudalism." DifferenceBetween.net. June 7, 2017 < http://www.differencebetween.net/miscellaneous/difference-between-capitalism-and-feudalism/ >. Oh, take me feudalism! Oh! I like it! Who writes this ? The “freedom to demand” is a contradiction in terms; there is no “freedom” in making demands of power, rather it is having the ability to make decisions in proportion to the extent that one is affected by the outcome of those decisions, in free association with others also affected–that is true freedom. In capitalist economies, a handful of wealthy elites control the vast majority of productive resources and the rest of us are left to serve them as lap dogs or labour for them as slaves. Freedom and capitalism are incompatible. Interesting post. While laissez-faire capitalism is generally what people refer to as capitalism, it is correct that free market or laissez-faire capitalism does not define capitalism. While it is correct to say Chronny capitalism or state capitalism does in fact create massive wealth divides, it is funny how the laissez-faire capitalism seems to be credited with the downfalls. With the understanding of capitalism as being laissez-faire capitalism by most people (many college textbooks calling the synonomous), it is very disigenous to equate the social accepted definition of capitalism with the other forms. Government corruption and favorable treatment of corporations have caused every company that came close to a monopoly in the US by exclusive grants, legislation, and barriers to entry. This is state capitalism or chronny capitalism which is nearly completely opposed to laissez-faire capitalism. This article pretty much covers every economic system that is not a completely commanded economy and labels it capitalism. The most command economy in the world is North Korea where the average person is 6″ shorter than their S Korean counterparts due to malnutrition. In a nutshell, while factually acurate, this article is very misleading to a general reader. Profits are why corporations corrupt government. I would also like to thank you for this interesting comparison. 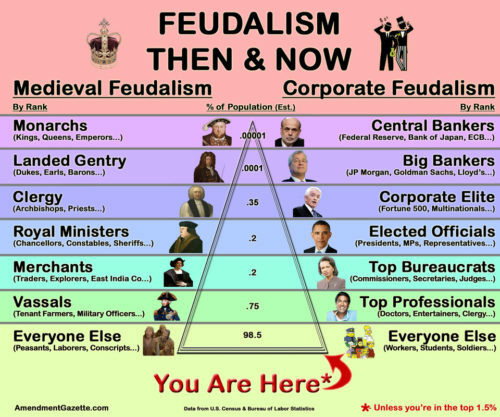 Also I think one of the main differences is that with feudalism you were stuck in the same class. While in Capitalism, your class could change from generation to generation. The American Dream is what is sold to us and until that dream becomes more of a fantasy then I think capitalism is here to stay. Thats theoretical…as capitalism advances, those who inherit capital are likely to maintain their status where those who do not inherit capital are also likely to maintain their status. In fact, the odds of rags to riches now are not enough to justify considering capitalism in the light that capitalists want us to. Wealth is concentrated far beyond what aptitude would result in which means those at the top aren’t the best and are denying rise by people who are peers or superior. End all inheritance and limit the amount of concentration of wealth, and then we can discuss the virtue of capitalism. It is intersting, right off the bat, Karl Marx is a “renowned economist.” and no mention anywhere of the likes of Milton Freidman or Ludwig von Mises. Karl Marx, the renowned economist, extolled a system which has brough misery and depredation to many hundreds of millions. And yet the article claims capitlism creats a wealth divide? the author’s bias is showing. Capitalism does create a wealth divide—due to its innate amorality; it openly chases profit (green market arrows over human well-being). When surplus piles up Capitalism seeks new markets to sell their excess off to. When domestic cries of “quality of life” ring out beneath the corporate machines, Capitalism moves overseas to exploit second and third world “savages” in order to “solve” the problem by importing cheaper products for their domestic proletariat to consume with their meager wages. Voila! inequality problem solved! Not really… the rich profiteers (multinationals) get to make more money, and keep their worker’s incomes stagnant with the magic pill of “made in china” and the Walmart’s of the world are ready to sling it for a buck. Now the poor can consume sub-par product and stop bitching and the rich can become dynastically wealthy. Why should the poor have access to equal “quality” when McDonalds is technically food, or when working at McDonalds is technically employment—never-mind the insufferable psychological damage that occurs when individuals are trapped systemically into positive feedback loops of poverty and inequality. Marx has been historically slandered due to Stalinist stagnation—no thanks to imperialist/colonialist allegiances out to stop any other system of economic development that doesn’t pay into Western profits. I’ve included some links below for educational purposes, they pull this debate into quantitative science. One thing that affects America’s continual last-place finishes in the OECD database is all the winners have democracies. America is an oligarchy as reported in a Princeton study, or it is pseudo-feudalism. The Feifdom in KS, Kochistan, sent the Vassal Paul Ryan his $500,000 payment for waging war against the poor, their tax allocations, and schools, for their billions in free money from the trillions borrowed and disbursed to other Fiefdoms, to paid back in the future by cutting all of that big 3 that created a middle class, and is enshrined in real democracy’s charter. https://en.wikipedia.org/wiki/Democracy_Index The USA is no longer a democracy and is closer to feudalism than many think. You are a genuine idiot. The difference is hardly substantial.